I used to happily chirp Happy Earth Day! each 22nd of April. Not to mention Happy Clean Up Australia Day! and Happy Earth Hour! and of course, Happy World Environment Day! But given my inherent desire to celebrate, well, pretty much anything, I can't let Earth Day slip by without some sort of recognition. And this year I'm taking inspiration from Earth Hour 2013 and its emphasis on taking it Beyond the Hour and encouraging you to make a commitment that will go beyond a day today by asking . 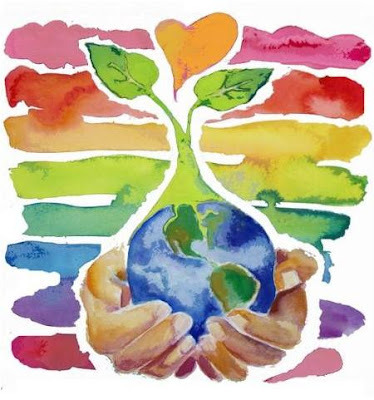 . .
How will you be greener by Earth Day 2014? What aspect of green living or environmentalism can you can adopt into your lifestyle that will last, and hopefully bring a continued amount of awareness to you and those around you? Perhaps you will . . .
Or a million other options that are more relevant to your lifestyle - only you know what will make the largest impact in your day to day life. I had to think for awhile on this one. Not because I'm a complete eco-goddess (yet!) but because I'm about to move countries and can't imagine all the ways my life will be different by this time next year. But I think I've got it . . . Since I'm moving to the United States, steeped in a rich history of free speech and activism, I am going to commit to become more involved in my political system as an advocate for environmental policy changes. I don't know exactly what it will look like just yet, but I'm putting my commitment here in writing, and I will definitely keep you all updated on how I become involved. So, what are you willing to put in writing? I'd love to hear from you! In the meantime, Happy Earth Day! Here's looking at a greener lifestyle for all of us by this time next year.